I love to photograph reflections in water. They produce stunning images. A good reflection shot of a beautiful scene is magical every time. What is it I find so fascinating about them? I think a reflection also represents a window into another world of sorts. I evaluate myself by the reflection I see in my bathroom mirror. I have often used the phrase, “At the end of the day I can stand in front of the mirror and look myself in the eye.” This implies a very deep contemplation of my own worth and integrity and how it measures up to the critical eye I cast upon myself. This self evaluation is enabled in the simple reflection I see in my bathroom mirror. I step into another place that allows me to accomplish something deeply personal and progressive that I otherwise struggle to see. 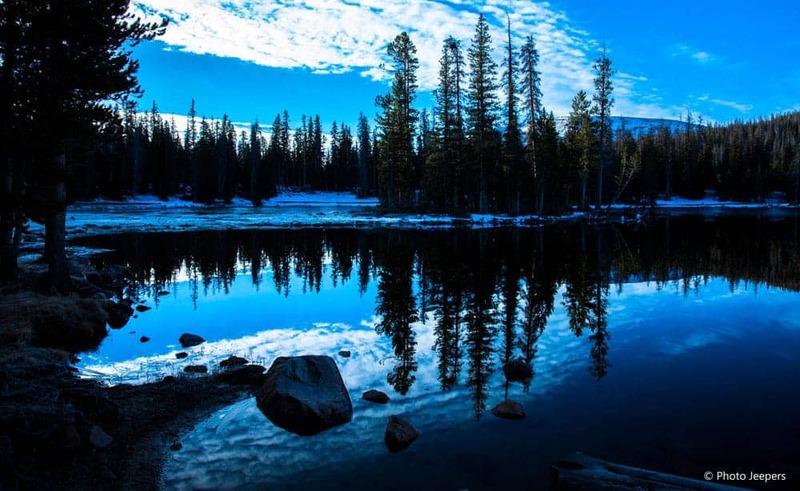 The perfect reflection of a beautiful scene cast upon a body of water accomplishes a very similar transition. The image encompassing the still liquid masks the secret deep beneath it, hiding unknown quantities of objects, horror and adventure. What lies within the deep? The reflection is a magic that can be perfectly preserved within a digital image, to experience again and again. I never tire of the magical reflection images I have captured. 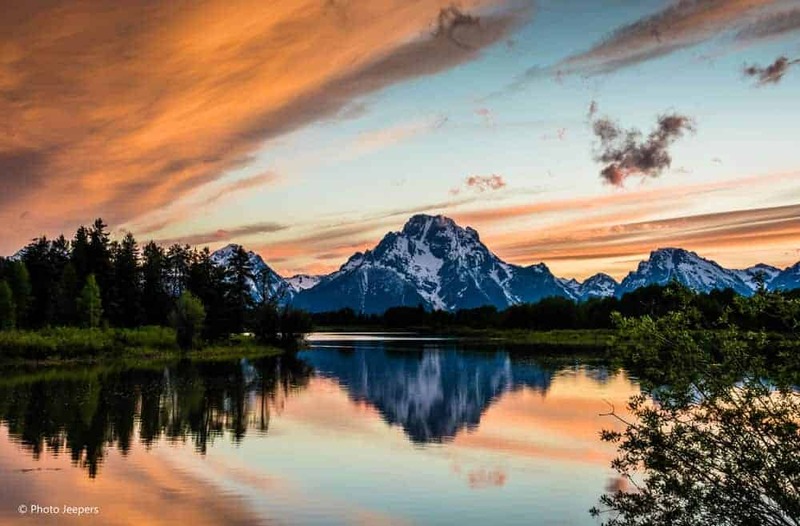 Capturing a stunning reflection image first requires the discovery of an ideal location. This is where the researcher in you pays off. Location is the foundation. 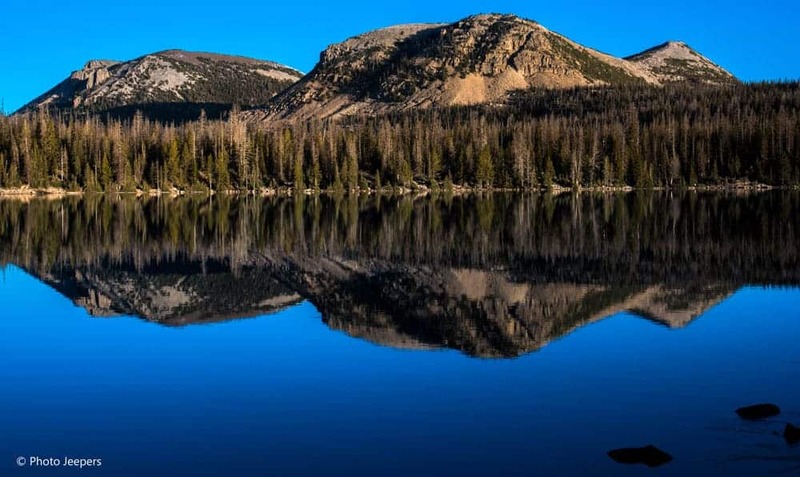 The calm waters of a lake or a slow moving river are ideal to capture a reflection. 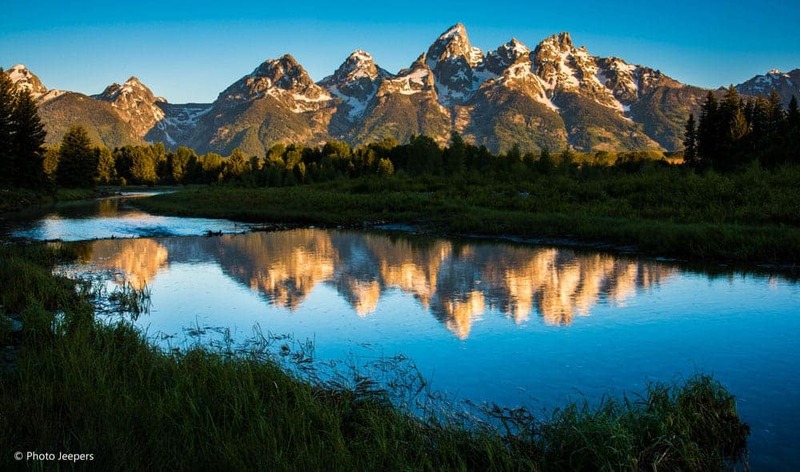 We knew from research that Oxbow Bend in the Grand Tetons was a good location for reflections in the Snake River. The sunset photo above had all the right elements to create a photo that just pops! The location, time of day, colors and still water. But those elements don’t always come together when you want to photograph a scene. In this image, the river wasn’t calm so the reflection wasn’t crystal clear. 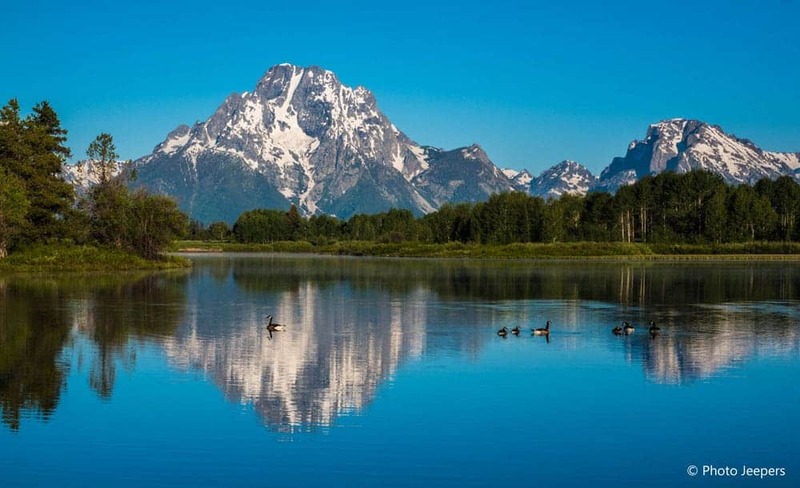 The mountains, landscape and geese in the water created a tranquil scene worth photographing. Many times you work with what it’s in front of you to create a memorable image. The best reflections are captured when the air is cool and there is no wind. The morning golden hour and evening around sunset are my favorite times to photograph reflection images. The water is cooler, the light is soft, and there are fewer people out and about. 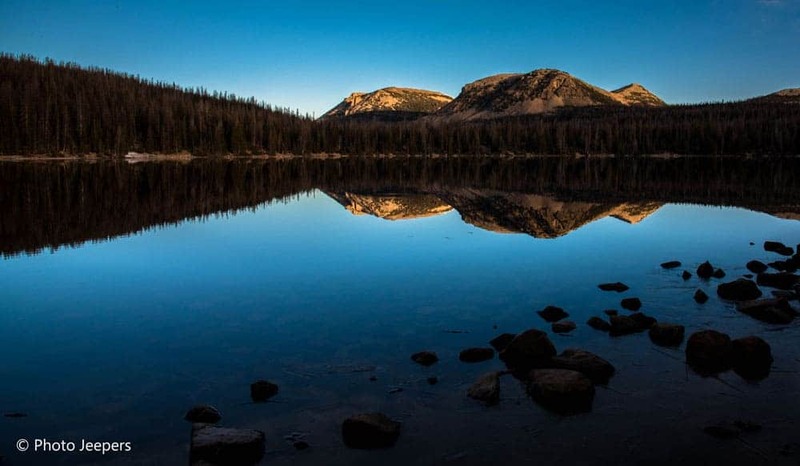 The best time for us to photograph Mirror Lake in Utah – the name perfectly describes this lake – is early morning in late fall. The high elevation lake usually has some snow at this time and it’s very cold in the morning. This usually deters the people who want to fish or paddleboard on the lake so we can take photos without people! Reflections are harder to capture during the day because you need the right natural light. At night you only need to worry about the man-made light. 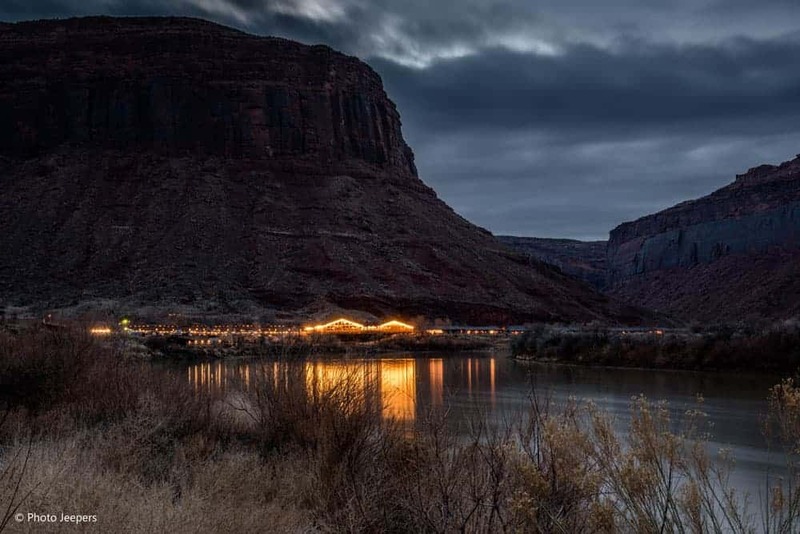 The lights from a resort along the Colorado River in Moab, Utah caught our eye one night and we stopped to photograph the scene. Watch for locations where you can photograph light upon a river, lake, fountain or even a puddle after rain. On our way home from Antelope Island one evening, we saw the lights of Salt Lake City, Utah reflecting into the Great Salt Lake. The snow-capped mountains and city lights reflecting into the water make a wonderful photo. 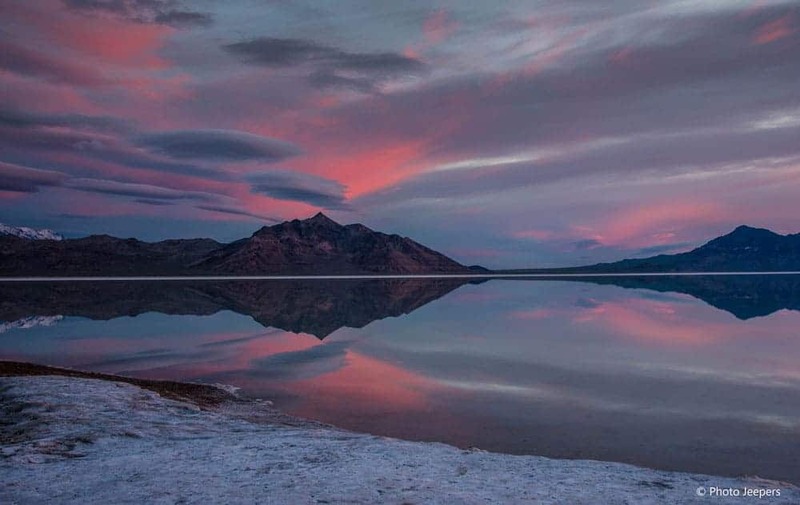 We knew that water collected on the Bonneville Salt Flats in Utah during the winter. 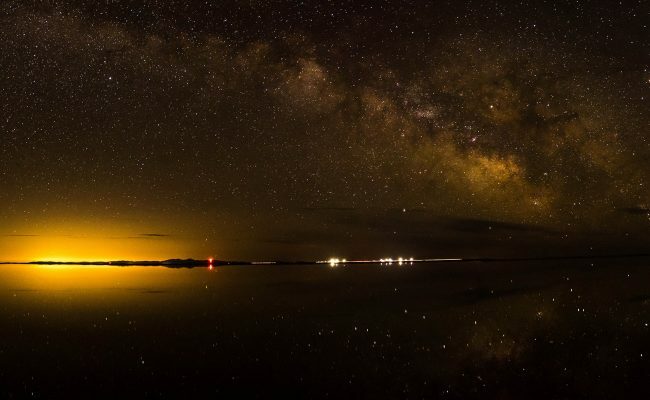 Our hope was to photograph the reflection of the milky way upon the water. Being winter, the air and water were cool, and we lucked out with no wind! The resulting image was a success. Composition can make or break the image you want to create. What you see with your eye can be greatly degraded with a poor composition. You’re there for the reflection so focus on that and compose the majority of your frame with the reflected surface. 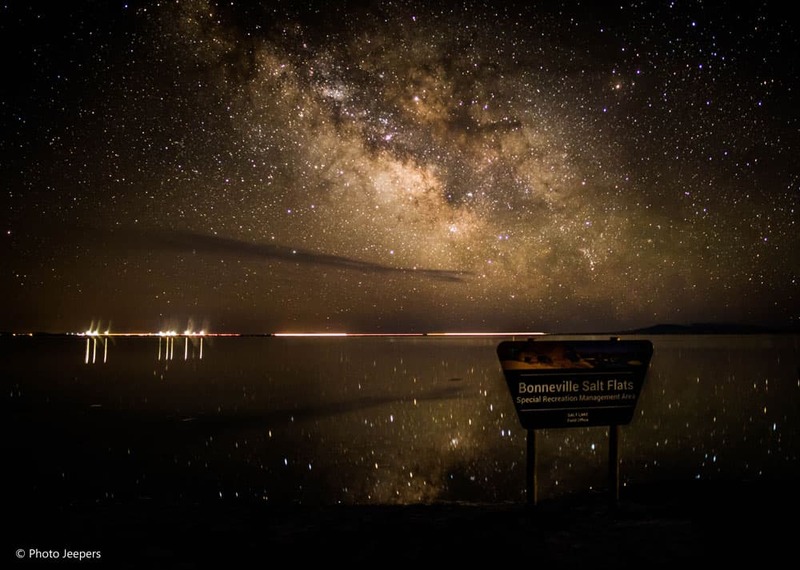 The image above is from the same trip to the Salt Flats where we photographed the Milky Way at night. 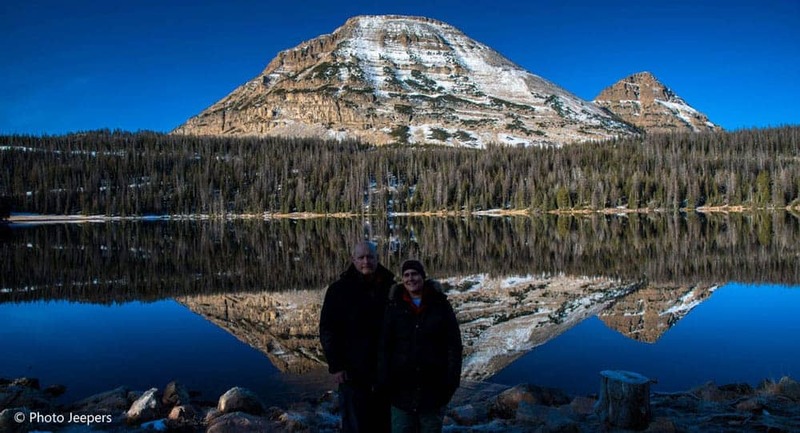 We stayed hoping to see a wonderful sunrise reflection – and we did! Choose a good foreground. I love to use rocks in the water or a log on the bank or shore. Compose your image so that the eye is drawn to the point where reality and reflection meet. A nice beautiful, blue sky then provides a soothing background. In order for my images to be sharp, I must use a sturdy tripod. Always photograph reflections with a good tripod. I have two tripods I use and recommend: MeFoto and FotoPro. The MeFoto Globetrotter Tripod I use is very good and fairly inexpensive. This is a wonderful travel tripod – read a detailed review. The FotoPro T-Series Tripod is fantastic and I love it. It is a bit more pricey, but was the logical next step for me as I improve my photography gear. It is sturdy enough to hold the larger lenses I use when I shoot wildlife. We are VERY impressed with the quick response time from their customer service department. Buy the best camera your budget will allow. 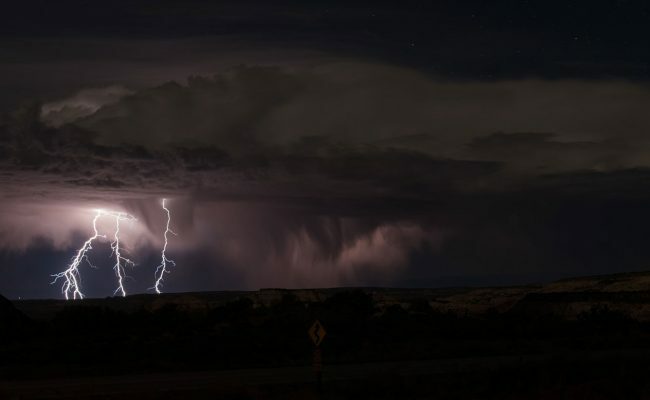 You need a decent DSLR camera (we are partial to Nikon) that allows you to control shutter speed, aperture, and ISO. There are many inexpensive cameras on the market that will do the job. You need a lens that produces sharp images. A nice telephoto lens is great, but I also enjoy using prime lenses. They tend to be cheaper than telephotos and can produce sharp images. I find that wider angles work best. For landscapes I use 24mm f/1.4, 50mm f/1.8, and 24-120mm f/4 lenses. These lenses all produce exceptionally sharp images and allow me a great degree of flexibility. 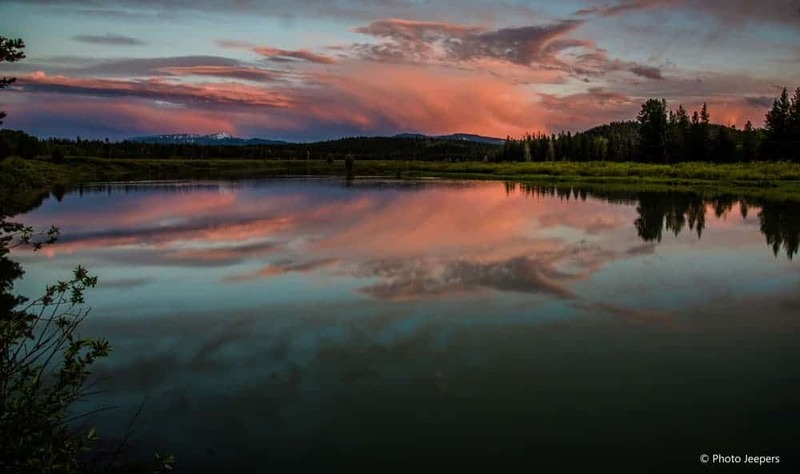 Select a prime location during the best light, compose the image and use quality equipment to produce a stunning reflection image that will inspire you for years to come. We utilize Pinterest to organize photography resources: Photo Tips Board – Photo Gear Board – Travel Inspiration Board – Travel Photography Locations Board. Use our boards for photography and travel information and inspiration. Save this to your photography boards and share with your friends! Some of the links on this site are affiliate links, which at no extra cost to you, will earn us a small commission and reduce the costs of running this site. A win-win right? Photo Jeepers is a participant in the Amazon Services LLC Associates Program, an affiliate advertising program designed to provide a means for sites to earn advertising fees by advertising and linking to Amazon.com. How Does the ISO Camera Setting Affect My Photos? I want to know what is the appropriate metering to be used while capturing reflection? Do I need to make it spot or center weight or matrix metering? And one more thing, what is the aperture value should I use, more than f/7.1? Dave always uses the matrix metering for reflections. The aperture depends on how much light and depth of field you want. He generally shoots with smaller apertures like 11 to 16 for reflections. Do you use any filters ? I rarely use filters. I do on occasion use a circular polarizer if shooting during the day in bright sunlight, and I will use a neutral density filter when shooting moving water to assist in capturing blur effects. Nicely elaborate the reflection photography tips. Thank you – photographing reflections is so fun and rewarding!